Where is Michigan Lottery Amphitheatre at Freedom Hill located and what is the address? 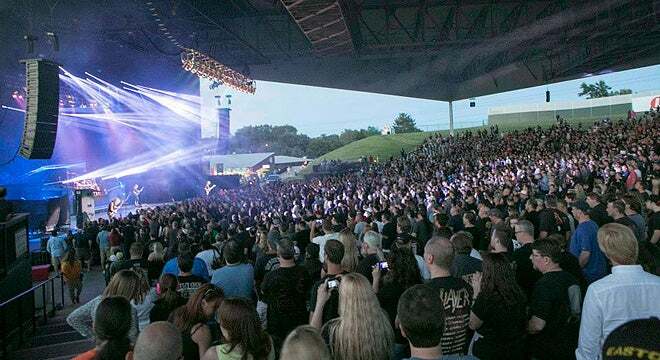 Michigan Lottery Amphitheatre at Freedom Hill is located in Sterling Heights, Michigan. The address is 14900 Metropolitan Parkway, just 3 ½ miles east of Van Dyke (M-53) in Sterling Heights. (Please note that Metropolitan Parkway is also known as 16 Mile or Big Beaver Rd.) Whether you are coming from Macomb, Oakland, Wayne, or St. Clair County, the amphitheatre is easily accessible from I-75, I-94, I-696, or M-59. What is the capacity of Michigan Lottery Amphitheatre at Freedom Hill? All events at Michigan Lottery Amphitheatre at Freedom Hill are “Rain or Shine” events. Only in extreme inclement weather are shows cancelled or postponed. What do I do if I lose my tickets? When tickets are lost, stolen, or not received in the mail, patrons must contact the location of purchase to issue duplicate seating passes. There are over 4,000 parking spots on site. Price varies depending on the event. All ticket sales are final. There are NO refunds or exchanges, even due to inclement weather. For a performance cancellation or date change, refunds are extended at the original point of purchase only. I am in a wheelchair. Can you accommodate me? It is the intent of Michigan Lottery Amphitheatre at Freedom Hill to meet or exceed the standard requirements for people with disabilities. What are the Box Office hours at Michigan Lottery Amphitheatre at Freedom Hill? Please note, the box office is typically open from June - September.